Led by Young Duck Kim, a postdoctoral research scientist in James Hone's group at Columbia Engineering, a team of scientists from Columbia, Seoul National University (SNU), and Korea Research Institute of Standards and Science (KRISS) reported today that they have demonstrated—for the first time—an on-chip visible light source using graphene, an atomically thin and perfectly crystalline form of carbon, as a filament. They attached small strips of graphene to metal electrodes, suspended the strips above the substrate, and passed a current through the filaments to cause them to heat up. The study, "Bright visible light emission from graphene," is published in the Advance Online Publication on Nature Nanotechnology's website on June 15. "We've created what is essentially the world's thinnest light bulb," says Hone, Wang Fon-Jen Professor of Mechanical Engineering at Columbia Engineering and co-author of the study. "This new type of 'broadband' light emitter can be integrated into chips and will pave the way towards the realization of atomically thin, flexible, and transparent displays, and graphene-based on-chip optical communications." Creating light in small structures on the surface of a chip is crucial for developing fully integrated 'photonic' circuits that do with light what is now done with electric currents in semiconductor integrated circuits. Researchers have developed many approaches to do this, but have not yet been able to put the oldest and simplest artificial light source—the incandescent light bulb—onto a chip. This is primarily because light bulb filaments must be extremely hot—thousands of degrees Celsius—in order to glow in the visible range and micro-scale metal wires cannot withstand such temperatures. In addition, heat transfer from the hot filament to its surroundings is extremely efficient at the microscale, making such structures impractical and leading to damage of the surrounding chip. By measuring the spectrum of the light emitted from the graphene, the team was able to show that the graphene was reaching temperatures of above 2500 degrees Celsius, hot enough to glow brightly. "The visible light from atomically thin graphene is so intense that it is visible even to the naked eye, without any additional magnification," explains Young Duck Kim, first and co-lead author on the paper and postdoctoral research scientist who works in Hone's group at Columbia Engineering. Interestingly, the spectrum of the emitted light showed peaks at specific wavelengths, which the team discovered was due to interference between the light emitted directly from the graphene and light reflecting off the silicon substrate and passing back through the graphene. Kim notes, "This is only possible because graphene is transparent, unlike any conventional filament, and allows us to tune the emission spectrum by changing the distance to the substrate." "At the highest temperatures, the electron temperature is much higher than that of acoustic vibrational modes of the graphene lattice, so that less energy is needed to attain temperatures needed for visible light emission," Myung-Ho Bae, a senior researcher at KRISS and co-lead author, observes. "These unique thermal properties allow us to heat the suspended graphene up to half of temperature of the sun, and improve efficiency 1000 times, as compared to graphene on a solid substrate." Yun Daniel Park, professor in the department of physics and astronomy at Seoul National University and co-lead author, notes that they are working with the same material that Thomas Edison used when he invented the incandescent light bulb: "Edison originally used carbon as a filament for his light bulb and here we are going back to the same element, but using it in its pure form—graphene—and at its ultimate size limit—one atom thick." The group is currently working to further characterize the performance of these devices—for example, how fast they can be turned on and off to create 'bits' for optical communications—and to develop techniques for integrating them into flexible substrates. Hone adds, "We are just starting to dream about other uses for these structures—for example, as micro-hotplates that can be heated to thousands of degrees in a fraction of a second to study high-temperature chemical reactions or catalysis." Photonic General Computers are coming closer and closer to being a reality. This is good news. In other words we could now make displays on contact lenses, walls and ceilings that can glow from any or all of their surface at once, credit cards thin spotlights and the perfect light source for space habitats where weight and efficiency are the most important. This can be big. I'm excite. Reminds me my excitement about OLED in late 90's. They've reinvented Edison's original light bulb (a piece of thread with carbon). I can't envision this as being particularly efficient or long lived. I dunno. I wouldn't relish having something with 2500°C near my eye. Photonic General Computers are coming closer and closer to being a reality. Photonic computer need efficient components. While this produces light it isn't particularly efficient (i.e. it produces a lot of waste heat and uses a lot of power compared to other sources like quantum dots). Despite the article telling you otherwise? The original Edison carbon filament bulbs were quite long lived as long as they were manufactured in a strong vacuum to stop the filament from burning out. The problem with bulk carbon is, that it evaporates at temperatures where it glows. This problem doesn't apply to graphene sheets because of the strong bonding between the atoms. WoW! Study of High Temperature Events at Nanoscale in Hotsprings Bacteria is Enabled! Superheated water is liquid water under pressure at temperatures between the usual boiling point, 100 °C (212 °F) and the critical temperature, 374 °C (705 °F). It is also known as "subcritical water" or "pressurized hot water." Are you now talking to yourself? And what the hell has any of what you say got to do with anything in the article? Current practice is enabling of Green Bioluminescence whenever certain reactions occur within a Cell. 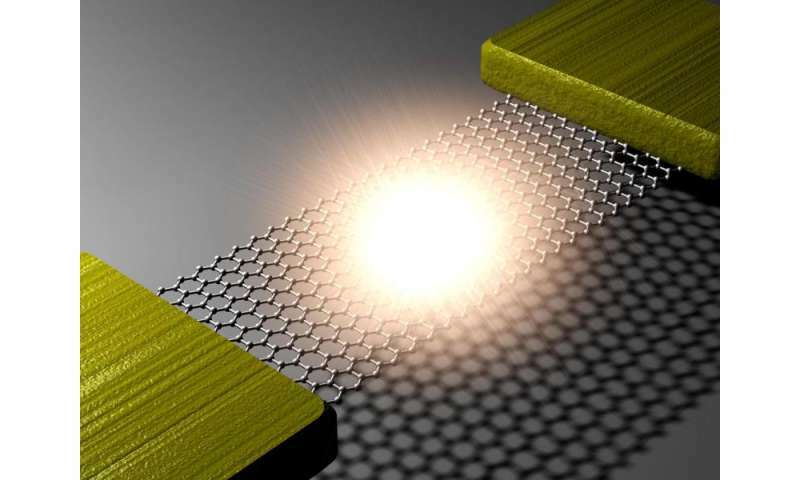 Now, Graphene can be used to light up when such occur. A few are still working. Only because they're barely glowing. That's the only way to keep the carbon from evaporating until the wire thins out and snaps. If you want a true forever-bulb, check out the Nernst bulb. Once lit, it will practically never burn out because the glowing filament is an inert ceramic rod. It didn't even need a glass cover. So instead of an inefficient 100 year old black body thermal light source with limited life, you have an inefficient black body light source that may never burn out. That technology already exists in many forms. Of all the interesting things we do with Graphene, I would have hoped that someone would have arrived at a more interesting way to use it as a light source.